march begins at 12:30 – if you want to march with us, we’ll be meeting right across the street from Ezell’s Chicken. what: The workshop will expose and analyze how the system stratifies the population through a set of “pipelines”. 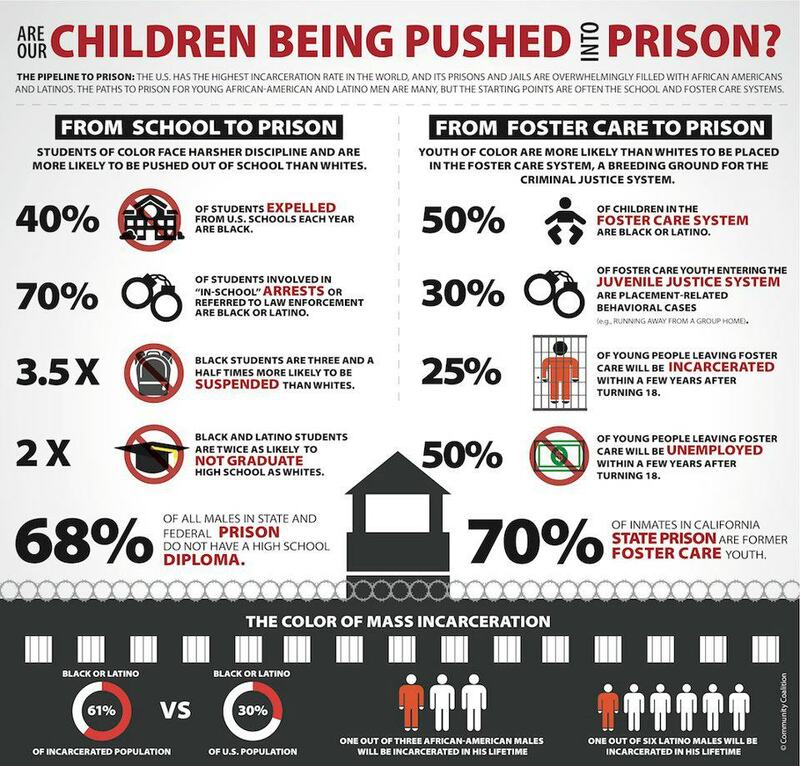 While some students are channeled into futures in management and the professions, and some into a working class, however insecure, still others are left to expect the least opportunities plus the threat of incarceration in the largest prison system in history. Teachers, students, former inmates, and activists, will share how this is all fitting into a pattern of especially insidious racism, as well as other forms of discrimination. You are invited to discuss these perspectives, and your own, with us. We will also discuss how we can inform, agitate, and organize together, to undo and overcome this oppression. This workshop is one of many that will be held as part of the larger, annual Martin Luther King Day event at Garfield High School. We will be marching together in the larger march, with posters and chants against the school to prison pipeline. Look out for us across from Ezells at 12:30 if you want to march with us. One of the teachers speaking in the workshop is the author of this piece, about how she and her students turned the isolation room in their classroom into an art project. Here is the Facebook event page for tomorrow. Please invite your friends. Check out the links for more information, and check out those groups or others if you’d like get involved in struggles against the school to prison pipeline here in Seattle. There are lots of ways to get involved, from organizing and fighting back, to educating and creating art and music on the subject. We’ll see you out there! Categories Class, Event, Mass Incarceration, Organizing Strategies, Parent / Family Organizing, Race, Student Organizing, Teacher organizing, What's happening in Seattle? The following is a press statement released yesterday from the More4Mann Coalition. It concerns a public hearing today, Dec. 12th, at 3 PM. Readers of this blog are encouraged to attend as supporters and witnesses. According to the press release, organizers expect that they will encounter a talking-to, not a genuine hearing. Have the district officials already made up their minds to approach their so-called “community partners” with coercive discipline instead of genuine dialogue? Have they already decided to expel these activists from district buildings without due process? If that’s the road they choose to go down, all I can say is that they will have chosen to treat parents, teachers, and community activists the way their schools all too often treat Black students. And that would simply highlight the importance of the More4Mann coalition’s original demands, the demands that folks were arrested while trying to make. It would also highlight the need to resume the culturally responsive programming that the coalition was doing in the Horace Mann building before they were interrupted by the arrests. In any case, this whole situation is far from over. Seattle Public Schools appears to continue doing everything it can to pretend that African Americans in Seattle don’t exist. For several years now, a broad coalition of Seattle’s African American community and its supporters have been (alongside the Federal Justice Department) calling out this School District for its over-50-year-long record of absolute failure to serve the educational needs of its African American constituents. The More 4 Mann coalition even mobilized volunteers, free of charge, to activate an impressive array of programs in the public Horace Mann School Building, which the District had not used since 2009. This August, the District claimed that it wanted to embrace and enter into partnership with this pro public education grassroots civil initiative, and engaged the More 4 Mann Coalition in several months of dialogue. The District and the Coalition convened a community task force that issued a progressive set of recommendations in favor of African American inclusion and involvement, both intellectual and manual, in the renovation of the Horace Mann Building, as well as in the curriculum and programming to be provided in that building when its renovation is complete. The task force also recommended a series of mitigating measures to prevent any complete displacement of the Africatown community from that historical address, either during OR after renovation. The District then signed a letter of its intent to adhere to these task force recommendations. Apparently, an old guard faction within the District then proceeded to reassert power, countermand the pragmatism of the Superintendent from LA, and to dictate his next actual moves as well as those of the Seattle Police. Electricity to the building was unilaterally shut off on November 9th, which interrupted many of our programs. Those programs which managed to continue were then also interrupted on November 19th, when Seattle Police raided the building without eviction notice or search warrant, unilaterally arresting three programmers (including a task force member) and one member of the general public who happened to be visiting the building at the time. While under arrest, these four were all handed an “Exclusion” flier by a representative of the District, which claims that they are forbidden to attend any School District meeting or set foot on any District property for one year, but that they may appeal this decision to an internal hearing process under “Board procedure F44.01”. This is clearly an attempt to prevent the More 4 Mann Coalition from presenting public grievances to our government, especially as it came only six days after another SPS “Admonishment” flier, which threatened to exclude a More 4 Mann task force member from School Board meetings if he made any more public criticisms of the District´s powerful and influential, but apparently incompetent General Counsel Ron English. Naturally, our coalition and its attorney have appealed these SPS fliers and demanded a public hearing. The District agreed to set this hearing for3 PM tomorrow, Thursday December 12th, at the John Stanford Building. THE PERSON WHO WILL RENDER THIIS HEARING’S DECISION IS THE SAME PERSON WHO AUTHORED AND SIGNED THE SPS FLIERS THAT WE ARE APPEALING! While we cannot consider this to be a legitimate hearing under such conditions, we shall still attend it to show our respect for civil procedure as community volunteers behind the School District’s stated mission of education and opportunities for all. Categories Event, Parent / Family Organizing, Race, Teacher organizing, What's happening in Seattle? Today the Seattle p0lice arrested four members of the Africatown / Central District community in the Horace Mann school building; they also took steps to prevent community members from retaking control of the building. One of the arrestees told me the police arrested them at gunpoint. While the mainstream media is presenting these men as “occupiers“, as a violent threat, or as some splinter group, they are, in fact, part of the broad-based More4Mann movement: a coalition of predominantly Black parents, teachers, students, and community activists who want the Horace Mann building to be a public resource for the Africatown/ Central District neighborhood and for students across the district. They want to use the building to create a school that can support Black students who are facing disproportionate suspensions and lack of culturally relevant education in the Seattle Public Schools. And this clearly doesn’t fit with the narrative they’re trying to push. LET THIS BE KNOWN: I am a More for Mann Coalition Task Force member, seated to discuss the future use of the Horace Mann building with the school district, as are two of my co-workers, Gabriel Prawl and Purnell Mitchell. My two co-workers have asked me to post the following on behalf of all three of us: WE HAVE NOT AGREED TO MOVE, AND WE ARE ANGRY THAT MANY OF OUR TEACHERS HAVE BEEN PUSHED OUT INTO THE COLD BY DISTRICT THREATS AND INTIMIDATION! We don’t think it’s right that they were forced to shut down their classes or face the threat “tresspass” charges from the district. It isn’t right that the school district refused to sign the lease on the interim space it offered them. It isn´t right that the school district hasn´t cleaned the mold, filth and birds nests out of that space. It isn´t right for them top make our teachers teach in the rainy streets. It isn´t even right that the school district attorney Ron English and the board members who listen to him are bullying Superintendent Banda into threatening to throw the cops at our community, and are punishing Banda for even convening our task force at all. So the mainstream media is either too lazy to investigate or too corrupt to tell the truth. It is crystal clear to anyone paying close attention, that those inside the building and those outside in the community are on the same team. This means that Seattle Public Schools officials will not be able to make all of this go away by arresting a few people inside – today’s raid will probably galvanize the broader coalition to keep fighting against racism in the schools in general, and for community control of the Mann building in particular. This afternoon, supporters of the movement rallied outside the East Precinct where the people arrested were released. Upon release, they called for everyone to mobilize tomorrow at the school board meeting at the John Stanford Center, 2445 3rd Ave S., Seattle, WA, 98134. This could get really interesting, because supporters of the Indian Heritage School and AS1/Pinehurst are already planning on rallying at 3:30 before the board meeting, to prevent the closure of their programs. On Facebook, leaders of the More4Mann Movement and leaders of the indigenous Idle No More movement have been exchanging statements of solidarity, supporting each others’ causes. Thinking they just crushed a marginal opposition, school district officials may have just helped consolidate a multi-racial movement against them. The media is, as usual, missing all of this context. By calling the men arrested “occupiers”, they fail to see that trying to use a public building for the purposes of publicly educating youth in your own neighborhood is not an act of occupation. That’s like saying you are occupying a neighborhood park by allowing your kids to swing on the swingset. But I guess this is how the pro-gentrification Seattle establishment views the remnant of the Black community in the Central Area – as squatters in their own ‘hood. And yet, this is the same Seattle whose politicians like to make a public show of engaging in “dialogue” with communities of color. In fact, the people arrested are part of the same exact More4Mann coalition that Seattle Public Schools Superintendent Jose Banda has been calling “community partners”. It is the exact same coalition that Banda and his staff are currently negotiating with to lease space in another district building while the district renovates the Mann building. Contrary to the Seattle Times’s sloppy reporting, the district has not signed this lease yet, for the reasons outlined here. At least they hadn’t by Nov 10th, the date of the last post on More4Mann’s blog. Neither the district nor the movement has announced any finalization of the lease, so my assumption is the Times is going off of outdated promises that Supt. Banda had made publicly but the district never followed through on. The deal was that the Africatown educators would move out of Horace Mann as long as the programs they were doing in the building continue elsewhere. But no satisfactory place for these programs was every guaranteed in writing. Also, the Africatown workers’ demands that Black folks have equal access to the school construction jobs were also not met. These are the reasons why people were still in the building today. So by asking the police to raid them, SPS is responsible for a raid on the very same coalition that has been running programming for Black youth in the Mann building for months, programming that Banda and other SPS officials recognized for its cultural relevance and its alignment with the district’s strategic goal of overcoming what they call the “achievement gap” between Black students and white students. In fact, at least one of the people arrested is actually part of the very task force that Supt. Banda set up to negotiate with the Mor4Mann coalition and to work toward this goal. This means that Seattle Public school staff worked with the Seattle Police to arrest at gunpoint someone who they claim to be negotiating with, during ongoing negotiations over a new lease and new partnership. I guess that’s what “dialogue” looks like to them. It seems to me like one of two things is going on here. Either 1) the district leadership’s behavior is dangerously erratic and it’s policies around racial equality are completely incoherent or 2) the district is sending a clear message to all of its “partners” that negotiating with politicians might involve them calling a group of people to kidnap you at gunpoint in your own neighborhood during the middle of the negotiation process. What a way to solidify a partnership! All of us should press on, despite all this negative media and and the police raid. The issues that MOre4Mann has highlighted are still unresolved. The community’s refusal to relinquish control of the Mann building has pushed the district leadership to talk about these issues, but I don’t think we should take their words seriously since they also just coordinated the arrest of someone on their own task force. Let’s learn from Africatown, and start taking matters into our own hands. Let’s organize in all of of our schools and neighborhoods, against racist discipline policies and in favor of culturally responsive education. 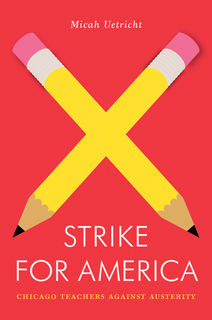 We could take direct action, such as campaigns to reinstate students who are unfairly suspended, or efforts to replace aversive discipline policies like isolation rooms. And, most importantly, we should support Africatown and the Indian Heritage program tomorrow at 3:30 at the school board meeting. 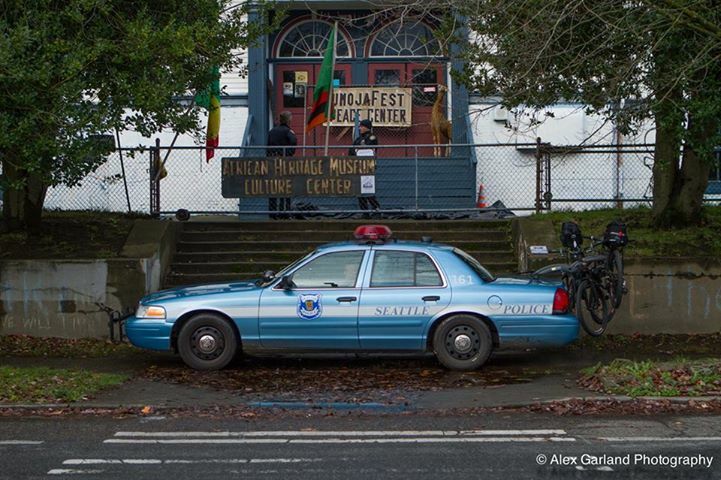 The Seattle Police Department has issued a notice to the Africatown Center for Education & Innovation to remove this needed community resource from its location at the Horace Mann School as soon as 6pm tonight, November 8, 2013. 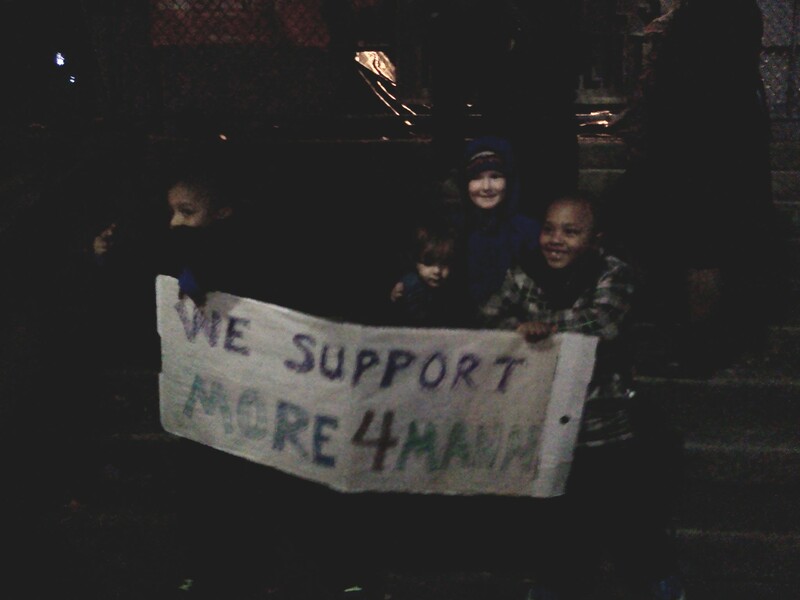 The Seattle School Board has refused to negotiate in good faith with Seattle’s Black community to preserve necessary programming at Horace Mann, Africatown’s only location, which benefits cross-cultural communities of color in Seattle’s Central District. The Seattle School District has, in spite of comment from Seattle’s Black community, chosen to return the NOVA Alternative School to Horace Mann. Overwhelming community support in the Central District and among the Black community for continuing ACEI’s mission has been ignored by the Seattle School District’s push to relocate NOVA from its current spacious and sufficient location central to its student body on 20th Ave E.
ACEI has put down roots in reclaiming Horace Mann School *for* the Black community and has brought in cross-cultural programs that benefit many Seattle children, from bilingual Spanish/English education for grade schoolers through the Seattle Amistad School’s summer program at ACEI to fostering shared community responsibility through the Africatown Center Children’s Collective where we bring the proverbial village together to promote an Afrocentric curriculum for young minds. It is imperative for Seattle’s Black community that we retain this resource and that the School Board speak to us in good faith about discussing future possibilities for Africatown at Horace Mann. We can work with the Seattle School District to create a better, Afrocentric focus for Horace Mann School, a school in the very heart of the Central District and we are more than willing to do so. 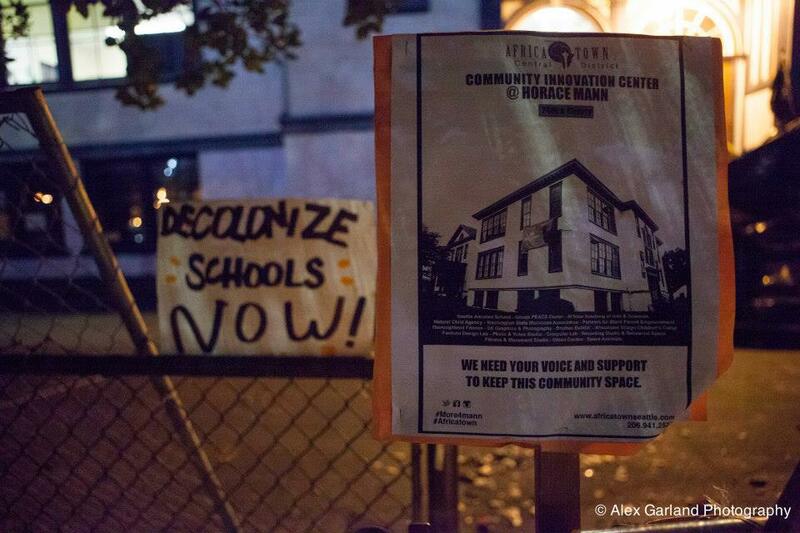 However, the Seattle School District has given ACEI nothing but bad faith and now impending eviction. For more information on the programs offered by Africatown Center for Education & Innovation, please see http://www.africatownseattle.org/africatown-center/. Categories Commentary, Event, Labor, Organizing Strategies, Parent / Family Organizing, Race, Self-Activity, Solidarity Statements, Teacher organizing, What's happening in Seattle? I agree. I’ll be there, and I encourage everyone to come. Between this and the fact that the district still hasn’t signed a lease with the Africatown educators (and are still threatening a police raid instead), the district is looking mighty callous in how it relates to communities of color. This also seems to be part of the ongoing standardization of curriculum and undermining of alternative education, which we also see with the suppression of the race and social justice curriculum at the Center School, and the closure of Pinehurst/ AS1. I’m still learning about this, but the sense I’m getting is that supporters of AS1/ Pinehurst are advocating that the district create a new, combined AS1- Indian Heritage Program with culturally responsive services and Native-focused instruction, instead of closing both programs. This also seems to be a demand that Idle No More organizers from the Native community will be raising at the rally on Weds (see the list of demands below). At the school board meeting on Weds, Supt. Banda will be proposing the closure of Pinehurst. But this amendment and also this one propose merging AS1 and Indian Heritage instead. It should be another very interesting and heated board meeting. Hope to see ya’ll there. Seattle Public Schools HAS CLOSED the Indian Heritage!! Please come and support our Native youth! If you are available to come and give public testimony of your support on Wednesday you need to CALL IN MONDAY 11/18/13 at 8 am (206) 252-0040 to get on the agenda. Please WEAR RED SHIRTS at the rally in a show of unity and solidarity as a collective voice opposing closure of Heritage and in support of new k-8 ‘Native Heritage ‘ ASI school and Indian Heritage at Ingraham/West Seattle school ( Fall 2014). After nearly 40 years of operation, the Seattle Public Schools (SPS) announced the closure of the American Indian Heritage Middle College High School, a.k.a. Indian Heritage, located at 1330 N. 90th Street, Seattle, WA. José Banda the Superintendent of Seattle Public Schools presented a public statement last July 2012 expressing commitment to consult with the Native community on ‘next steps’ in consideration of revitalizing the Indian Heritage, the pending BEX Levy, demolition of the Indian Heritage facilities, and the preservation of the murals created by Andrew Morrison. Instead the Indian Heritage and Native students suffered continued decline in 2012-2013 being reduced to digital learning, no Native-focused instruction, no Native-infused curriculum, and a new instructor unfamiliar to Native students, parents, and community. The Native community proposals and concerns addressing these drastic changes have been ignored by SPS. 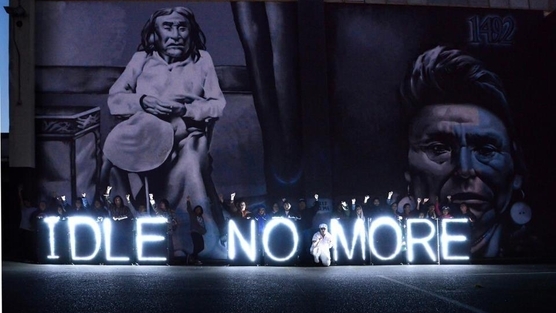 After the May rally to save the Indian Heritage program SPS had met with Native community members and said the Native students would be temporarily relocated to Lincoln High School during construction of the new school, that SPS would work with them in revitalizing Indian Heritage, that the murals would be preserved, and Indian Heritage would come back to the new school. Instead SPS claims the Indian Heritage was eliminated because there were ‘not enough kids’, but SPS never contacted the students about the plan and made no effort to recruit new students, the Native students have now been forced to assimilate into an entirely different program and relocated to Northgate Mall. It is unconscionable that resources been completely withdrawn from Native programming and services, while SPS acknowledges the statistical facts illustrating disproportionate academic performance, disciplinary action, and highest dropout rates for Native learners. We want SPS to address why 30% of Native students are in Special Education, we want to know why SPS fails to comply with Individualized Education Program and 504 Basic Plan, and why Native students are underserved and over represented in this area of education. The trajectory for Native learners in SPS is of tremendous concern given the districts decisions to eliminate Indian Heritage and displace current programs functioning at the Indian Heritage facilities. • Temporarily relocate the Indian Heritage program to Lincoln High School as planned NOT to Northgate Mall until the new site has been completed in 2017. (4) research, evaluation, data collection, and technical assistance. Thus as Title VII Part A states, “ensuring that programs that serve Indian children are of the highest quality and provide for not only the basic elementary and secondary educational needs, but also the unique educational and culturally related academic needs of these children.” Currently there is absolutely no demonstration of this in SPS relocation program. • We recommend that all the murals that were made by artist Andrew Morrison (Apache/Haida) be preserved and incorporated in its original form into the new school (and not be replicated as Mr. Morrison requests). • Rename the Wilson-Pacific School ‘Robert Eaglestaff School thereby keeping a promise made to the Native community in 1996 by John Stanford and echoed by Norm Rice. • Provide support for new a ‘Native Heritage’ AS-I school with Native focused instruction/curriculum and culturally responsive services. • Preserve the Sacred Site of the Duwamish Licton Springs. Also, there is a petition to investigate the elimination of the program. Categories Event, Parent / Family Organizing, Race, Solidarity Statements, What's happening in Seattle? I’m continually disappointed with the hostility that Melissa Westbrook from Save Seattle Schools blog has shown toward the More4Mann movement and the Africatown Innovation Center at Horace Mann. As I argue below, if we want to fight privatization and save public school buildings from private use, we should be supporting the efforts in Africatown, not opposing them. It strikes me that Melissa is coming from an administrative, building-management perspective, rather than a holistic perspective that puts the students first. For her, managing public school buildings is concrete, and the majority of her reporting on this story has focused on chiding the district for loosing control of the Mann building when community members refused to leave it. She goes on and on about the polices around public building management, until the purpose of public school buildings in the first place – educating students -starts to seem distant and abstract. If I were an editor at the Onion, I’d write a satirical piece entitled “Education blogger takes on the achievement gap between buildings”. Truly, it seems like Melissa wants to make sure that no building is left behind. This puts her on a collision course with the parents and educators in Africatown who have focused their efforts around the students themselves and what they need. They have continued to hold the Mann building because they have concrete plans for how to use it to help their kids – and all kids. 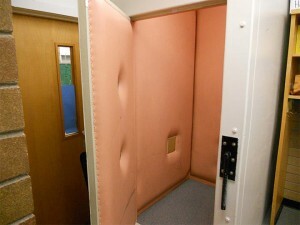 They care about the students enough to risk arrest. 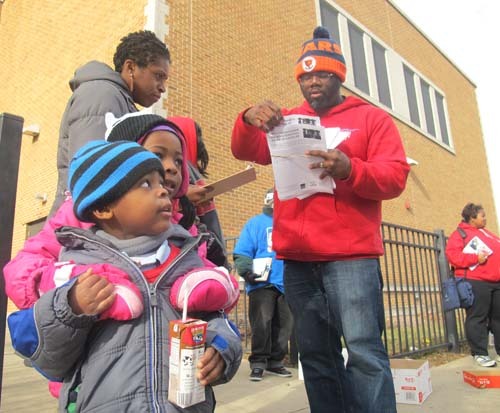 They are impatient with the districts’ hand-wringing about the so-called “achievement gap”. They are not letting red tape stall the efforts necessary to dismantle the oppression Black students face in Seattle Public Schools. However, I don’t want to dismiss Melissa’s care for buildings entirely. She is right that there is a history of scandal and corruption in SPS around the mismanagement of public buildings. Given this, bloggers and the public in general should be vigilant about how the district enforces or fails to enforce its own policies. She is also right to fight the pro-privatization forces that are clearly attacking public school districts across the nation. These astro-turf, billionaire funded “community groups” try to throw public officials and employees off balance, creating crises that can be exploited to sell off parts of the public school system at fire sale prices. They also use this chaos as an arena to research, test, and market new management and consulting services. Diane Ravitch has documented all of this thoroughly in her new book Reign of Error. The More4Mann Coalition is NOT this kind of group. They are distrustful of Seattle Public Schools for good reason. But this does not mean they are part of a corporate privatization agenda. They have continuously said they want to partner with the public schools, and as a teacher I have experienced nothing but support and solidarity at Africatown events. They are attempting to create a public educational resource rooted in the Africatown neighborhood, serving the public good in that neighborhood. As longshore worker Leith Kahl pointed out at the Oct. 5th summit, these kinds of efforts are exactly how public education was founded in the first place. The Africatown organizers are also committed to transforming public schools across the district through teacher/parent/student organizing and professional development for educators. Even more concretely, they have an impressive track record of clashing with some of the very people who have been implicated in privatization efforts and corruption. The article below presents some of the early history of the More4Mann movement, when the Umoja P.E.A.C.E. center, Decolonize / Occupy movement participants, and other groupings allied to prevent condo developers from gaining control of the Mann building. This article was originally posted in the comments section of a misleading report by the Stranger. Please keep this article in mind when you hear people claim that the people in the Mann building are trying to take a public building for their own private reasons. Also, please remember this when you hear district officials say they need to move Nova back into Mann in order to alleviate the district-wide space crunch. Let’s ask why that space crunch exists in the first place. I wonder – if the founders of the More4Mann movement hadn’t started taking direct action at Mann back in 2011, would the district even be trying to return Nova to the building? Or would they be working with developers like LEXAS to lay the groundwork for future condos and more gentrification? The downsizing and privatizing of education in the US is a brutally physical process. Perhaps nowhere was this more clear than in Seattle´s Central Area on Veterans Day, when a crowd of young people refused to leave a public meeting about the future of a public school building at 24th and Cherry, which has sat vacant since the end of 2008. Police were called to eject the public from the building, and one youth and one community elder were arrested and charged with “tresspassing” and “disorderly conduct”. An advertisement in the The Facts Newspaper had clearly invited the general public to this meeting. The meeting called by the leaders of an organization called “Family Life Center”, a ministry of Peoples Institutional Baptist Church, which also sometimes does business under the name “Work It Out”. This entity was awarded a lease on the building by the Seattle Public School District about a year and a half ago, even though their lease bid was neither the highest bid, nor was it a bid that contained any committment to the school district to use the building for any purpose relating to public education. Their were other bids which did offer such an explicit committment, including one from the nearby Umojafest Peace Center which has a track record of turning blighted buildings into vibrant centers of community programming with almost no budget at all. The United For Youth Coalition, a coalition of which the Umojafest Peace Center is a member, called upon its members and supporters to attend this public meeting and voice their concerns, which they did. When the “Work It Out” entity reacted to the presence of these youth by first cancelling the meeting, and then asking the Seattle Police Department to eject the public from the building, the Coalition responded by staging a protest on the sidewalk immediately outside of the building. Some members of Occupy Seattle and other local groups also attended both the meeting and the protest which followed it. In the significant time that has passed since the “Work It Out” entity was awarded the lease on the property by the school district, the impressive building and the grounds around it have continued to sit fenced, empty and vacant, except for a few occasional days when work parties of volunteers organized by the Umojafest Peace Center were allowed into the building by “Work It Out” officers to perform the grunt work of cleaning up the facility. Although the “Work It Out” entity holds the lease and the keys, it has no budget of its own sufficient to pay for the lease that was awarded to it, and is only able to make the payments on this lease by means of a public grant of over $100,000 that it is recieving from the City of Seattle´s Department of Neighborhoods. The “Work It Out” entity has also recently announced in The Facts Newspaper that a religious organization will be moving into the building. The Seattle Public School District has already established its reputation for privatizing public buildings this year, and for doing so in a manner that has become infamous for intrigue and cronyism. The most well know example was the controversial sale of Martin Luther King elementary school to a private religious organization, which in turn was issued public funds with which to purchase the now vacant and derilect school. (See Seattle Times article June 5th, 2011 “State investigates Seattle district´s sale of MLK school” – seattletimes.nwsource.com/html/localnews…; ). http://www.seattleschools.org/modules/cm… . “The Seattle Public Schools leases out portions of operating school buildings, closed buildings, and conducts sales of surplus buildings from time to time”, this website proudly proclaims. The very idea that a public school district would use the term “surplus” to describe any of its facilities at a time when prisons and detention centers are still being rapidly constructed throughout the country displays a certain degree of contempt for the public trust that has been invested in this school board. The recent financial scandals that have led to the termination of former superintendent Goodlowe Johnson and the arrest of the scam artist Silas Potter further illustrate the school districts contempt for that public trust. Is this pattern now repeating itself yet again in the case of the Horace Mann school building? Why would a building leased to a private organization at public expense proceed to sit vacant for over a year and a half? The reason why becomes apparent, even to the amature investigator, when we simply examine who sits on the “Work It Out” project´s steering committee (workitoutseattle.org/staff.html). This ten person committee nominally claims to include eight members of the Peoples Institutional Baptist Church community, including Jocquelyn Duncan and Charelyn Stennis (daughters of the late Bertha Jinkens), Charisse Cowan Pitre (an associate professor of Teacher Education at Seattle University), Erin Fleeks (a staff member at the Central Area Senior Center), Loris Blue (Vice President of enrollment at SCCC), and local Seattle DJ Guy Davis. There are, however only two members of this committee who are directly connected to the Seattle ruling class power structure and the investment capital behind it. These two are Kristen M. Link and Sheryl Frisk, Investement Associate and Vice President, respectively, of a real estate investment and trading firm called LEXAS Companies (www.lexascompanies.com). LEXAS Companies publicly describes itelf as “a private real estate investment company that creates value in quality projects with distinct competitive advantages” organized to “strategically select geographical areas, submarkets, product, and cycle timing to create superior risk adjusted returns”. “In the capacity of Vice President, Sheryl Frisk is responsible for the acquisition and management of income producing projects for The LEXAS Companies and its subsidiaries. Sheryl manages all phases of operations of the real estate process, from locating and acquiring assets to the repositioning and disposition of investments. Sheryl serves as the key liaison with banks, investors, and Board of Directors on all aspects of the projects she develops. Sheryl is responsible for managing project specific sales teams, construction companies, consultants, and administrative and on site employees. LEXAS Companies is clearly not in the business of educating young people. It is in the business of deriving profit from real estate investment transactions. Peoples Institutional Baptist Church is an old, venerable, and relatively respected institution in the Central Area, but it does not and never has weilded power within the the downtown city machine or within the world of major investment capital. Anyone who thinks that PIBC, on its own, is capable of developing the Horace Mann building is not thinking realistically. In this case, the church is being used as a pawn by LEXAS Companies, a tool with which to occupy a space on the real estate chess board which the school district is either unable or unwilling to protect for the benefit of our children. In this writer´s opinion, the church will only be useful to LEXAS until the real estate market and the political climate are ripe for LEXAS to make its move to develop the site into high priced and profitable condominiums, just as the Housing Resource Group corporation has done with 90% of the space inside of the old Coleman building, a small corner of which is still laughably touted as the “Northwest African American Museum”. Until then, LEXAS just needs the “Work It Out” steering committee to maintain a pretense in the media that some community activity is taking place under its auspices, while ensuring that the building itself remains empty and fenced off. That is the reason why the ministers of “Work It Out” believed they needed to summon the Seattle Police to eject members of the public from a publicly advertised public meeting in a public building on Veterans Day of 2011. They are loyally protecting the real estate interests of downtown investors who are unlikely to ever reward them for this favor. Peoples Instututional Baptist Church can change this course of events by directing its ministry to unite with the Umojafest Peace Center and the United For Youth Coalition to actually produce public programming in this public space for the benefit of the young people who need it most. Categories Commentary, Parent / Family Organizing, Race, Student Organizing, Teacher organizing, What's happening in Seattle?